Mercury's retrograde is perhaps the most "famous" of astrological transits, being mentioned on a fairly regular basis in popular culture. The general understanding of Mercury retrograde is "things go wrong" -- but that's only a fraction of the story. Let's look a little deeper. First, what's a "retrograde"? In simple terms, a planet moving in retrograde motion appears to be moving in the opposite direction to its normal path of motion through the heavens. The planets normally move from west to east across the sky in relation to the stars. Periodically, however, they appear to slow, stop, and move "backward" for a time, from east to west. This is an optical illusion, which occurs because we on the earth are also in motion, as are the planets. As we all move in our orbits around the Sun at various speeds, we overtake and pass one another, with the slower planet temporarily appearing to move backward from the point of view of the faster one. In the case of Mercury and Venus, the two planets which are closer to the Sun than the earth, the apparent backward motion occurs as they pass on the opposite side of the Sun from us -- we are moving in one direction on the "near" side of the Sun, while they move in the opposite direction on the "far" side. The astrological symbolism of a retrograde planet is drawn from this idea of moving backward. The affairs related to that planet tend to slow or get bogged down. The functions related to that planet don't work correctly, and things often literally "take a step backward." Formerly hidden problems or issues come to the surface where they must be dealt with. Although this process can often feel very annoying and frustrating, it in many ways can also be highly beneficial (regardless of which planet is involved), by forcing us to deal with problems or issues which would otherwise hold us back or weaken us in the longer term. 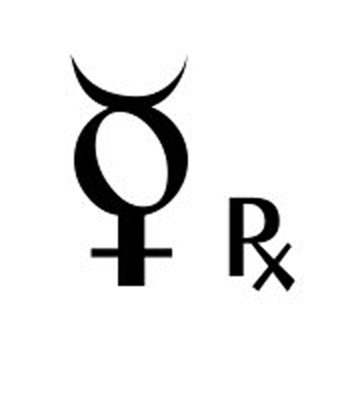 Mercury astrologically represents the conscious logical mind, its thought processes, and the physical manifestations of those processes (such as writings, speech, etc.). Thus, when Mercury is retrograde, the most obvious interpretation is that the logical mind is not operating correctly. This can be the result of faulty logic, of not seeing the entire picture, of jumping to conclusions, of overly emotional reactions... you can see already how the "things go wrong" idea of Mercury retrograde can emerge from this sort of "mental malfunction"! But by the same token, simply being aware that this is the way you (and others!) will react during Mercury's retrograde can help you to minimize many of these sorts of problems. If you know you'll tend to overreact during this period, you can make a point to take extra time to make important decisions. If you know that others may tend to be overly emotional, you can make a point to (for example) hold your tongue when someone speaks rashly or harshly, realizing they probably don't really mean what they're saying. "Making mountains out of molehills" could be another key phrase for Mercury retrograde. Indeed, things going wrong is only half the story during these times -- the other half being our own over-reactions to what are often just minor problems or annoyances. Recognizing that tendency to over-react, and acting consciously to minimize it, is a great way to keep your own and others' sanity during these times.